Photograph of Fairbottom Bobs in around 1880. This date is based on another picture of around that date, and also later pictures showing the engine to be in greater disrepair. In the background can be seen Tanpitfield Row and Westerhill, a house bought in 1889 by Samuel Lees, of Park Bridge Ironworks, for his son. There is very little left now to mark the site of "Fairbottom Bobs," an interesting piece of industrial history, which stood close to the River Medlock, about half a mile from Park Bridge, Ashton under Lyne. 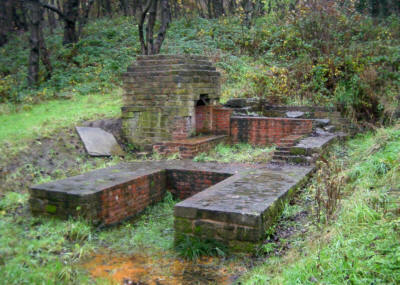 The structure known as Fairbottom Bobs was, in fact, a Newcomen atmospheric engine - a very early steam engine. 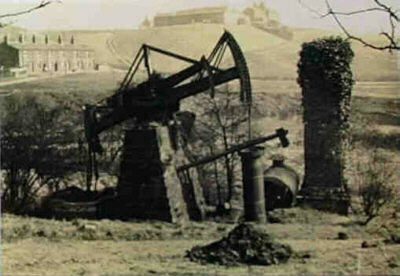 It was built here, in an area known as Fairbottom, possibly around 1760, to pump water out of the Cannel coal pits, which were about 200 feet deep. The name arose from the bobbing motion of the wooden beam. The water was pumped along a wooden trough to top up the level of the Fairbottom Branch Canal, 200 metres away at Fenny Fields Bridge. 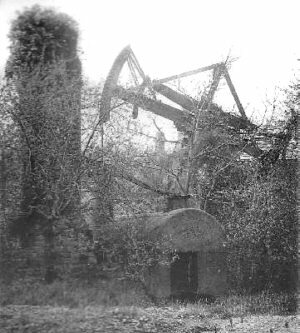 The engine ceased to be used in 1834 and by the time the above photograph was taken in the 1880s, had become a local curiosity, sometimes mistakenly called "Watt's First Engine." Another photograph shows visitors in Victorian dress posing in front of the engine, showing that the ivy-covered chimney on the right was around 20 feet tall. A slightly later picture, judging from the growth of bushes. Photograph courtesy of Patricia Brumpton, Australia. Photographs from the 1920s show the engine to be in a bad state of repair. In 1929 it was bought by Henry Ford and taken to America where it is now on display in the Dearborn Museum. Henry Ford compensated the locality for the loss of its famous relic by paying for the construction of a footbridge across the river. 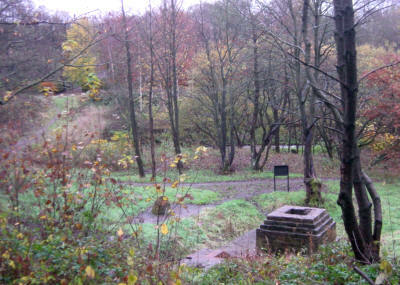 The area around Fairbottom Bobs is now thickly wooded, and the ruins were allowed to become overgrown. Walkers following the Oldham Way often pass within a few feet without any idea of the history of this almost-forgotten corner. In 2000, the site was excavated by the University of Manchester Archaeological Unit, revealing substantial remains. The photographs on the left show the remains of the Fairbottom Bobs site today. The two piers to the front of the photograph (left) seated the boiler seen in the top two pictures. Between the piers was an ash pit. 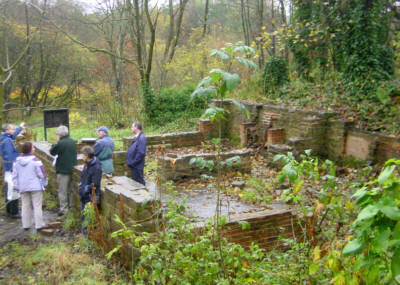 The large structure behind is the base of the chimney, built to draw smoke from the boiler. The pump, with its rocking beam, would have been situated to the right of the chimney. A similar view to the photograph at the top of the page. Only the base of the chimney in the top picture can still be seen. Trees now block the view across the valley. Remains of cottages at Fairbottom. The remains of two cottages close to Fairbottom Bobs. They may have housed the workers responsible for keeping the steam engine running and pumping water from the mine. The cottages were inhabited until around 50 years ago.